Same for me. I am running an older version of excel ( 2010 I think )but I'm guessing that that's not the problem. I never clicked on this link yet, Link to Audacity to LOR Script: (I provide no support for this): https://drive.google...EJoQmpiUGM/view. Do I need to install something off here as well? What's it do? P.S Spent some time south of Austin in June ( Buda ). Pretty awesome place and Salt Lick was a great experience as well! I do just that and nothing happens, no prompt or anything. I'm going to try to reboot the pc when I get home from work tomorrow and see if that makes a difference. I did just that and nothing happens, no prompt or anything. I'm going to try to reboot my PC in the morning and see if it makes a difference. The problem I have is you went so fast on using your script that I couldn't keep up. Do I need to save each lable in a seperate file? I saved it in a file I made with the LO()R and Music in it for Batman Smells and saved the poly etc. all in the same folder. I do not know whare I need to save or put the perl script you wrote at.. I did download and install Perl and your script. I could not figure out how to get your script to work because you went threw it so fast even pausing and restarting your video didnt help me.. I have no Idea what you are typing in your COMMAND PROMPT as you never explained it.. I can open your script in note pad and I do have the beat, poly, etc. all saved with no problem. Just cant get past that part..
Any idea what I am or am not doing to get it right? I Do Like you Videos and have watched most of them more then once and have learned a lot from you and them. I have not been able to get your script to work.. I just cant figure out how you opened it and put the other labels in it. I do have the labels all on note pad but am lost after that. Great job on this. Have used on several songs in the past week. Sure cuts down on the time to create a show. I went from be behind on my Halloween show, to being caught up and now adding a couple more songs. Thanks Grinch But I have NO IDEA where I am suppose to put that script.. I Don't have the slightest idea how to open and use Command Prompt to do it. It Looked like it was all done in command prompt on the video.. I have never taken any kind of computer programming, or DOS class.. Maybe that's why I am completely lost with using the command prompt to do things. I guess I am out of luck on being able to do things using the script even though it looked really easy to do.. I am not schooled in computers at all. But I do Thank You For Trying to help me..
every time I run the analyze for POLY, audacity locksup, I have tried the restart thing like john mentioned above but no luck....anything I can do to make it work or am I just stuck not being able to use it until I can get a better computer? This is really cool. Thank you so much for putting this together. Look forward to trying it out tomorrow. oh so I need to save the perl script in each folder where I put the timings in for each song. If I understand right I need to for example make a folder for each song, save the script in it and then work on it in the same file?? So I need to save a master script and copy paste it into the files to use it?? and then add to it there..
Do I have to use the CMD PROMPT to do things... That was where he completely lost me on the video as I know nothing about the command prompt commands and how to use it... Is there a different way such as copy paste etc. to do it?? Thank You And I apologize for being so computer illiterate in today's computer age..
Sarge you do not need to put the script in every folder. This is how I set it up. I created a specific folder to store only the script on my C: drive. I just called it music (C:\music). In this folder I have the perl script and I save my exported files from audacity to this same folder. Then each time I am starting a new file I overwrite the previous files ex: onset.txt, bar.txt, beat.txt, poly.txt etc. Hope it makes it clear as mud. If not let me know and I'll try and explain it a little better. I'm not real familiar (any longer) with dos commands so I simply created a word doc outlining all of the commands I would need to run the script each time I wanted. If you set your script up in the same manner I'll be happy to email you the word file if it helps. I'm like Sarge, not the computer savey person. Could you send that word file also. Maybe I can get the light to come on to how to use this. Yup sure will. Keep in mind that you will need to create the c:\music folder (this is not the same as the normal music folder), and you will need to save the script to this folder along with saving all of your exported labels from audacity into this folder as well. You can save those files any where you like but the commands i'm sending you will not work as written. If you need help creating the folder let me know. Thats sounds really great to me... I will set it up as you have and do it that way. You can have your script anywhere on your PC. You will just need to add a root path in windows to find the command. I have setup my script in a folder like "D:\scripts\". I use audicity to create my txt files for the timings in a folder for just that song. Then i can run the script by calling on its command and the script runs great.. This is going to be great.. I feel i can get more accomplished. Its going to make life much easier sequencing. mpha, myself and Halfmoon, and probably some others aren't computer savey enough to know what you are talking about..
We know there are many who know how to do things like you suggested as well as how to type in commands on the command prompt etc., but we are not them..
That is why we are patiently waiting for Dan to get the sep by step way he does it done for us.. If you read all our posts you would know he tried to explain it to us and we have watched the video numerous times but we are waiting for Dan to give us the STEP BY STEP how to do it ... not just say,,, this is what you have to do ..
but thanks for you input on it. I did send my file back to you with a question about in and the files that I had made. Again I want to thank both John and Dan. I haven't quite figured out on how and where to cut paste script. I'll review John's video again to see what I'm not making the connection. Dan what you sent was a big help. I did get the email. I just haven't had a chance to look over it yet. I will tomorrow afternoon. If you are ava I can try and walk you through it tomorrow around 3pm central time. Let me know. I knew from the beginning that throwing some PERL scripts out there would be skipping over quite a few basic concepts that depending on background somebody might not have been exposed to before. (I found a few of these gaps on my hardware background). So while this doesn't cover all gaps this at least covers getting a hold of PERL and installing it. Note that for this application you don't need to install any add-on modules. 1. Select the LOR sequence file. 3. Enter the name that you'll want to call the timing grid in the LOR sequence file. At this point you can just click the Process button if you want, but there are several other options you can use. By default, the tool will make a backup copy of your Sequence file before it does any work. The backup file is named <sequence file name>.LORTools.BAK. 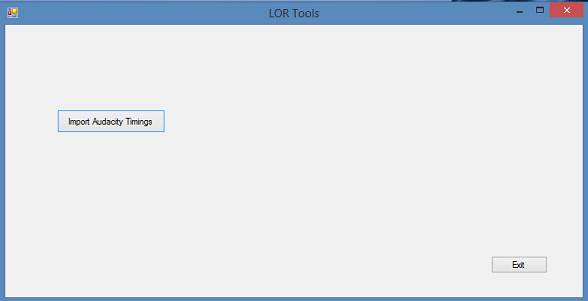 This will keep any backup files made by LORTools separate from the backup files made by LOR. By default, the tool will add the new timing grid with the next available SaveID number. If you know what you're doing and want to specify a specific SaveID number, you can click the radio button and input the saveID number to use. 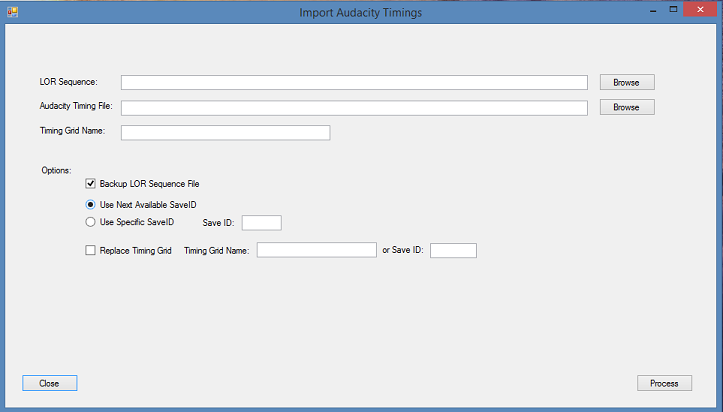 By default, the tool will import the Audacity timings as a new timing grid. However, you can have it relpace an existing timing grid by checking the box and specifying the timing grid by either Name or SaveID. At this point it doesn't do the Polyphonic stuff from John's script, but I hope to add that after the season is over. If after all of the disclaimers you're still interested in it , I am happy to share it with all that would like a copy. If enough people are interested, I might try to find someone who would be willing to host a copy on some type of file sharing service. I would love to get your feedback and ideas for improving and adding to the toolset as well!